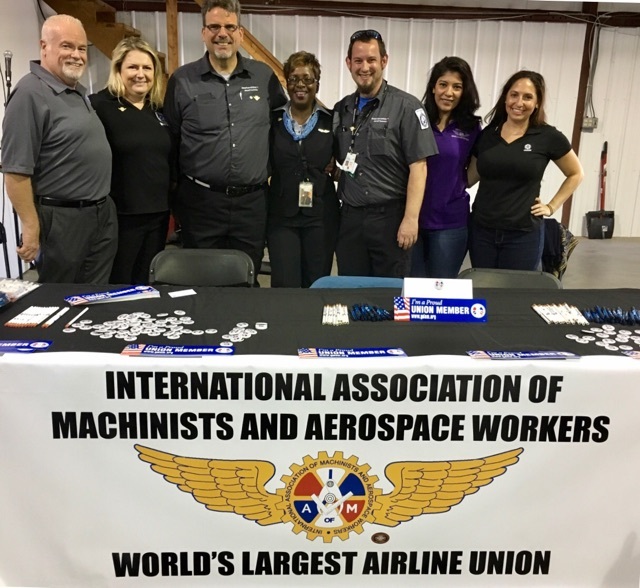 On Saturday, IAM members from Districts 141 and 142 took part in the first-ever Aviation Career Day and Airport Open House event held just outside of Chicago, at Whiteside County Airport. The purpose of the event was to inspire the next generation of aviation industry professionals, ranging from flight attendants and pilots to ramp, customer service agents, mechanics and engineers. The free event featured exhibitors from area aviation businesses, corporate flight departments, aircraft charter, regional airlines, air traffic control facilities, community colleges and more. Several aircraft were flown into the event so people could get an up close and personal view, including ExpressJet Airlines which flew in an ERJ145 and gave tours on it throughout the day.